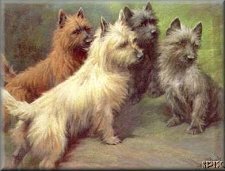 Col. Potter Cairn Rescue Network is a national, all-volunteer, not-for-profit 501(c)3 charitable organization whose supporters are committed to the rescue, rehabilitation, and re-homing of Cairn Terriers and almost Cairn Terriers. We welcome anyone with a love for animals to join us. There are many different ways you can volunteer, and help is greatly needed in every capacity. You can make a big difference to a Cairn in need by giving your time and talents as a volunteer. How did you hear about Col. Potter Cairn Rescue Network and why are you interested in volunteering? Foster Home: Foster homes are greatly needed and appreciated. Being a foster home can be as short as an over night that is needed during a transport, keeping a dog for a few days until other foster arrangements can be made, or until placement is made (long term). This is the most critical need in our rescue chain. We can only save as many Cairns as we have foster homes. All approved expenses are reimbursed. Cairn Rescue/Intakes: Volunteers who can I.D. Cairns in person or on websites, call shelters and surrendering owners or pull dogs from shelters and take to a safe haven (a boarding facility or vets office) are always needed. All approved expenses are reimbursed. Transportation: Transporting dogs from shelters to foster homes, or from foster homes to forever homes. Please complete our Transport Volunteer Form if you can help. Home Safety Inspections: A "Home Safety Inspection," or a "Home Visit" as the final step in CPCRN's five-part adoption process. Since CPCRN is a national Rescue program, much of our adoption process is handled through e-mail and phone calls. The home visit is truly the only chance that we have PRIOR to the placement of one of our Rescue dogs to ensure that the Cairn will be in a safe and loving home. Volunteers are needed to conduct home visits in your area as well as in an administrative capacity helping to schedule visits around the country and Canada. Training, forms and instructions are provided for all Home Safety Inspection volunteers. Sponsor a Dog: Click the link to make a tax-deductible donation to pay for the care of a rescued Cairn. Please note below other ways you can help raise much needed funds for rescued Cairns. Reference Checks: Volunteers are always needed to check adoptive and foster home references. This step in our adoption process is also essential to the foster home approval as well. The majority of checks are made via telephone -- phone cards, instructions and support are provided by CPCRN. Post Adoption: Volunteers are needed to follow-up with our adoptive homes, gather "Happy Endings" and provide support to families and their new Cairn buddies. Phone cards and training are provided. Fundraising: Our fundraising efforts are an integral part of Rescue. We welcome anyone who can offer items to sell in auctions or through our Cairn Shopping Mall where we offer many hand-crafted items made by volunteers. helping with art that is needed for fundraiser projects. used for our eBay or other online auctions. and send these out when notified of a sale (expenses reimbursed).